A Baltic cruise is a fantastic way to visit this striking part of the world famed for so much of its stunning architecture, enriching medieval museums and art galleries. Baltic cruise holidays are an ideal choice if you are looking for a no-fly cruise option, setting sail directly from the UK with the choice of many northern departure ports as well as Southampton. 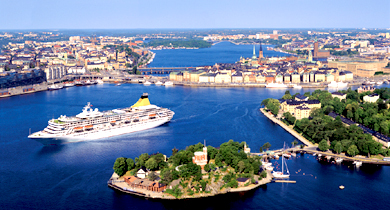 Baltic cruises take in the best of Scandinavia and the countries surrounding the Baltic sea, visiting the fascinating cities of Copenhagen, Oslo, Helsinki, Tallinn, Stockholm and St. Petersburg. Choose from mini 4 day cruises through to leisurely 13 night cruises, allowing you to thoroughly explore all the capital cities that are on offer with a Baltic cruise. If you are looking for a cruise around the Fjords, then take a look at our Norwegian cruises. Discover the fascinating country of Russia and its beautiful former capital city, St. Petersburg, with a Baltic cruise holiday. A vast array of culture awaits you in the myriad of art museums throughout this enchanting onion domed city. Enjoy a fascinating insight into an historic country by taking a shore excursion in Estonia. Legend has it that the capital city of Tallinn was founded by an exiled Danish princess who successfully defended the city against all who tried to overthrow her. Visitors to the city marvel at the magnificent domed Russian Orthodox Cathedral, the fascinating Kiek in de Kok watchtower, so called for having a sneaky view into peoples homes, and the fabulously bustly cafe lined Town Hall Square. Dock in Sweden's delightful city of Stockholm and wander around the maze of islands, exploring the stunning architecture and the fashionable cafes and shops. Alternatively, stop off in Gothenburg, to the West of Sweden, and visit its quieter streets for a truly "Swedish" experience against its delightful backdrop of canals and parks. Helsinki stands unwittingly proud of its seascape positioning and is one of the most interesting stop offs on your journey. This cosmopolitan capital city plays host to many lively bistrots and trendy eateries, and has more more historic culture than you can shake a stick at. Be sure to visit the Russian influenced Cathedral on Senate Square as well as the fortress on Suomenlinna. Visit the beautiful city of Copenhagen as you stop off in Denmark and see the statue of the "Little Mermaid", glimmering on her rock, a tribute to Hans Christian Andersen's popular fairytale. This fabulous, lively city is an absolute must while on your Baltic Cruise. The restaurant and bar lined streets are simply oozing with personality and are waiting to be uncovered.